After a 4 years absence, the Cougar Pulling Team from Hörby, in Sweden returns to the National and European Pulling circuits. 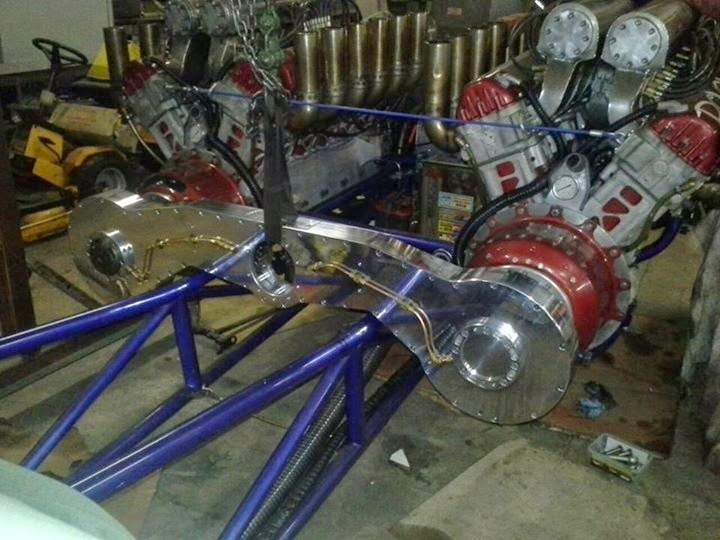 The Swedish Team are building a new Mini Rod with a blown Chevy V8 engine at the moment. The Cougar Team will compete in the Swedish Championship and in the Euro Cup this year. 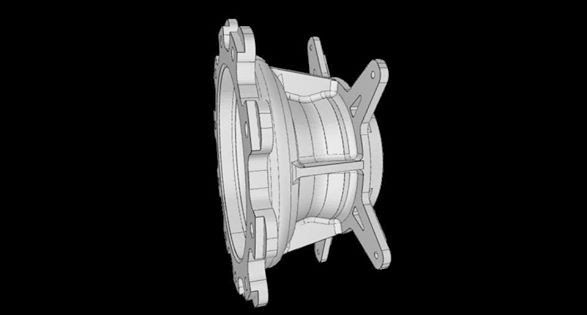 Further information about the new Mini Rod project of the Cougar Team in the next few weeks, chech here at pullingworld.com. On the 7th. 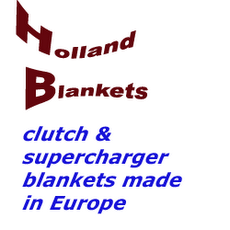 of March 2015 it was time for the 37th European Superpull in Ahoy, Rotterdam (NL). We have a short review of what happened at Ahoy 3 weeks ago. The first class in the afternoon session was the Super Stock class. The class was won by Hendrik Svenningsen with his Alky MF called ,,Rabbit gone´ Wild´´ from Denmark. In runner up position was the reigning European Champion of 2014, Green Gangster Deere with Rowan Zeinstra in the hot seat and in 3rd place was the Ford called ,,Rabbit gone´ Mad´´ from Denmark. 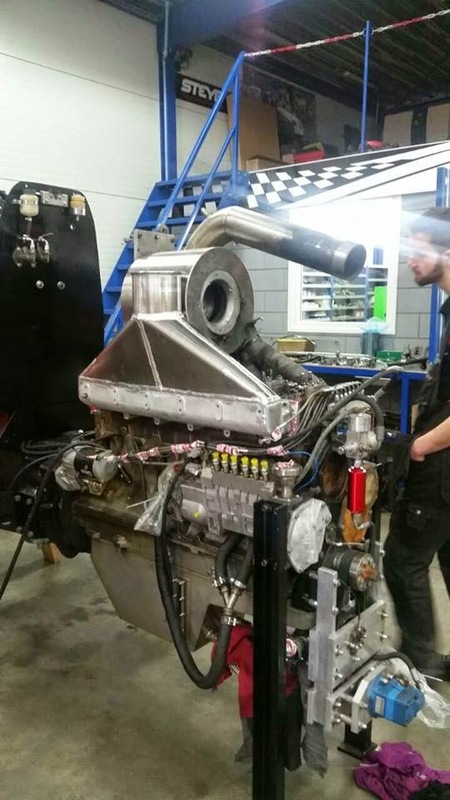 One of the spectacular moments in this class was the run of Cropshop Six Shooter from Netherlands, where the engine blew the intake manifold up and damaged also the hood of the Case IH. The Truck Pulling class was won by Team van Vlastuin Agro and the Super Sport 4.5t class was won by the Case called ,,White Shadow´´ from the Netherlands. I was in the pits the most of the time to take some pics while both classes made their runs on the track. So, I can't tell so much about those classes. The last class of the afternoon session was the 3.5t Modified class. The class was won by Bas Liefting with Whispering Giant, in runner up position was Berrie Boer with his Double Screamin´and in 3rd place was the new Intertechno Lambada with Willem Dingerink behind the wheel. The Green Monster Team from Germany tested in this class a new home made supercharger on the front Allison engine of the Green Monster an . The first run with the new supercharger was well or for now and everything was intact after the pull. It showed some surge issues, but the team are hopeful to get those fixed in time for the outdoor season. a great qualifying run (the rest of the field was 7m behind him), but it blew up its turbocharger in a big bang in the finals. 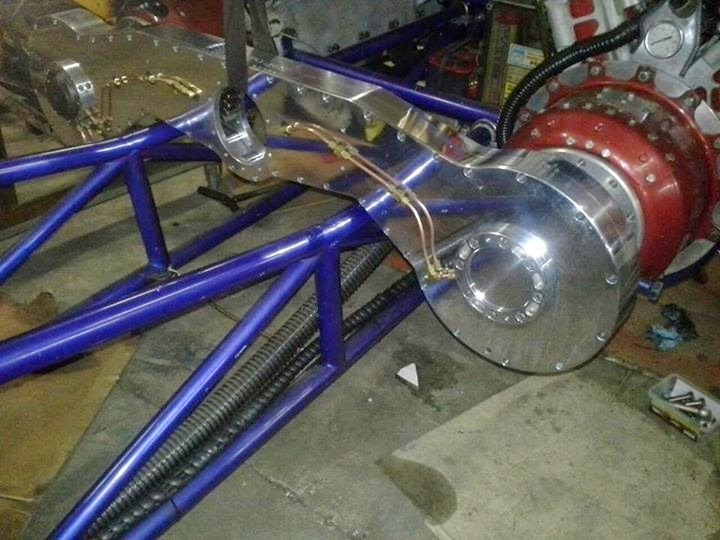 The exhaust wheel made it through the shielding and steel hood, so there are more things to expect in regards of turbo shielding before the outdoor season. The TWD class was won by the reigning European Champion Intertechno Predator, in runner up position was Sledge Hammer and in 3rd was XL from Sweden. The Mini Rod class was a fight between the two brothers Wim Dingerink and Gert Dingerink. Wim Dingerink won the class with Hella Lambada 9. It was the last pull of the tractor in this design. The tractor will get a new design and a new paint job after the event. A few meters behind him, was his brother Gert Dingerink with Gencom Lambada 8 in 2nd and the 3rd place went to Vampire with Kees Vreeman behind wheel. The last class of the day was the Super Modified class and it was a close battle between some tractors. 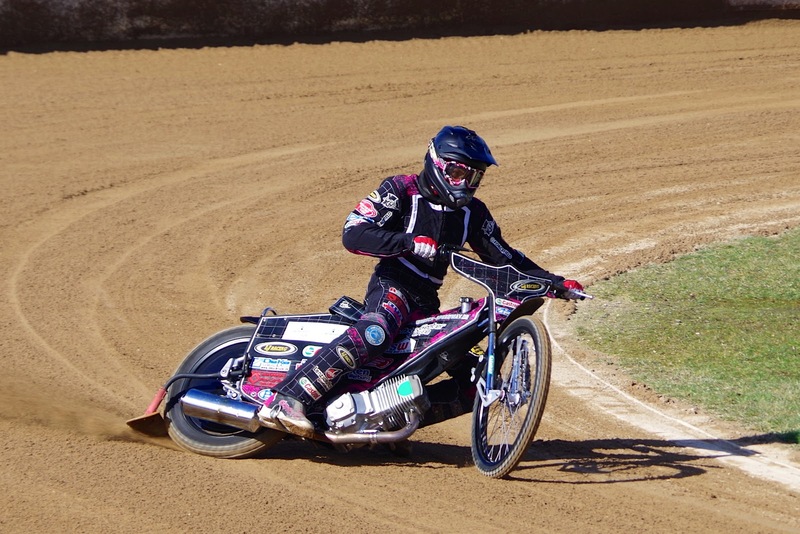 The Zwolle winner Green Fighter couldn´t qualify for the finals so Enrico Vollerthun finished in 5th behind Alessandro Rocco with Four No Hemi from Italy. 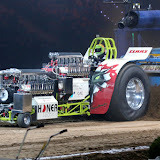 The Pull Off was won by Wim Dingerink with his new Intertechno Lambada, in runner up position was the quad turbine tractor called ,,Rising Star´´ with Jan Bosman and in 3rd was Bas Liefting with Whispering Giant. 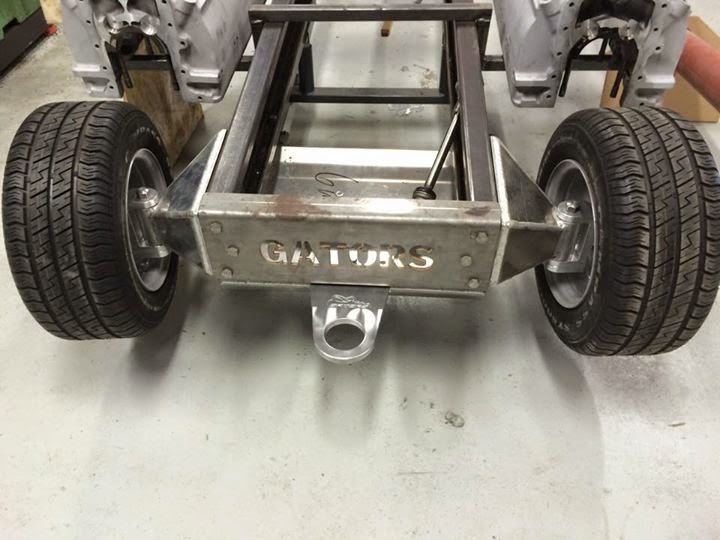 The Gators Pulling Team from Denmark are working hard on their new twin Rover Meteor V12 powered Light Mod tractor at the moment. 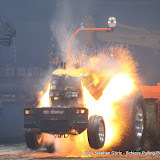 The Rising Star Pulling Team from Oene, in the Netherlands has a new website and now their own page on Facebook. 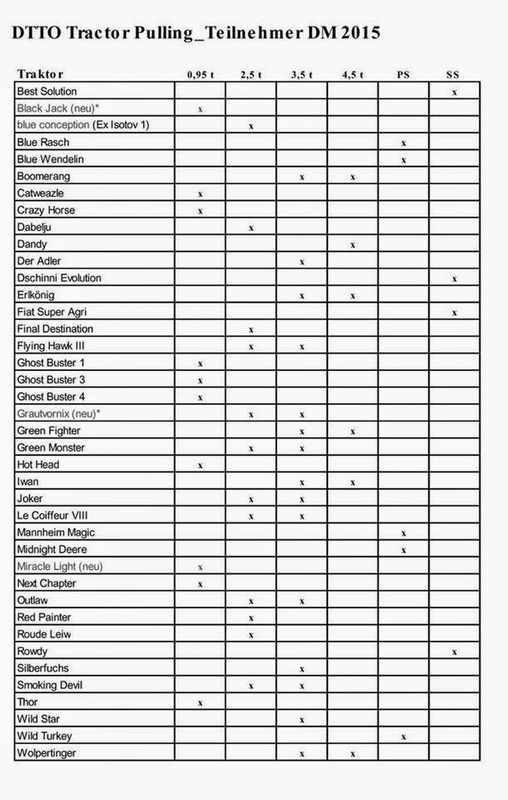 German Championship competitors are known ! 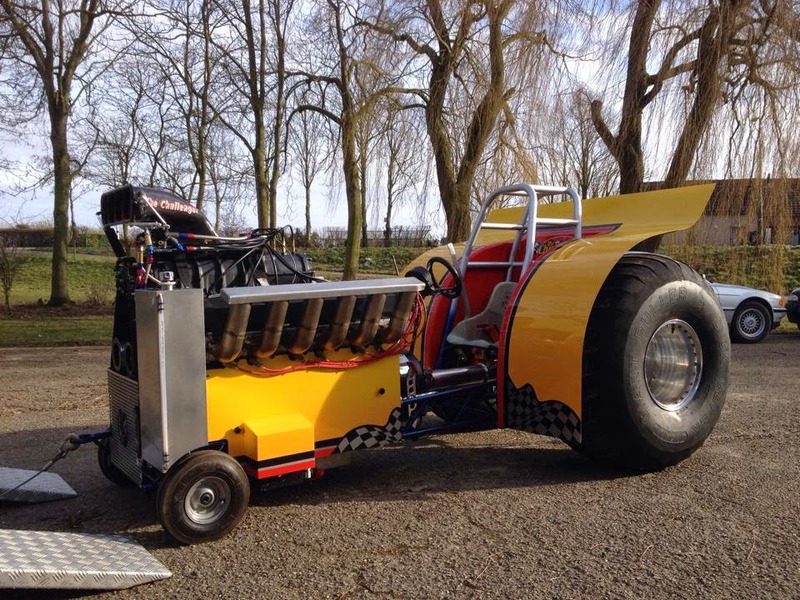 The Twin Rover Meteor V12 powered Light Modified tractor called ,,DeJongSpecial´´ gets some changes at the moment. The tractor got a completely new Crossbox. 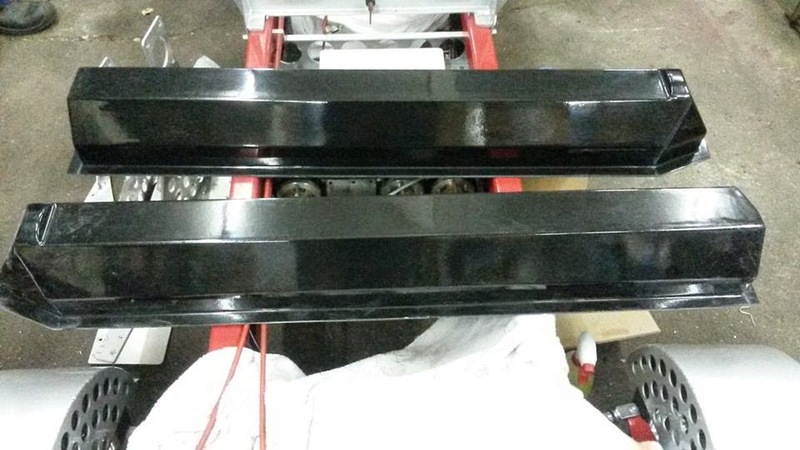 The new Crossbox moved more forward and now sits on the back of the two Rover Meteor V12 tank engines. The Team hopes to get a better transmission and a better balance with those changes. Also, the Light Mod gets some better gears and better axle shafts in the rear axle. Last but not least, the two Rover Meteor V12 tank engines get some better and stronger connecting rod bolts. The Team from Alphen, in the Netherlands will compete in the Dutch Grand National Championship and in the Euro Cup this year. The tractor for the Light Modified and Modified class from Ijsselmuiden, in the Netherlands got some changes after the Indoor Pull in Zwolle. 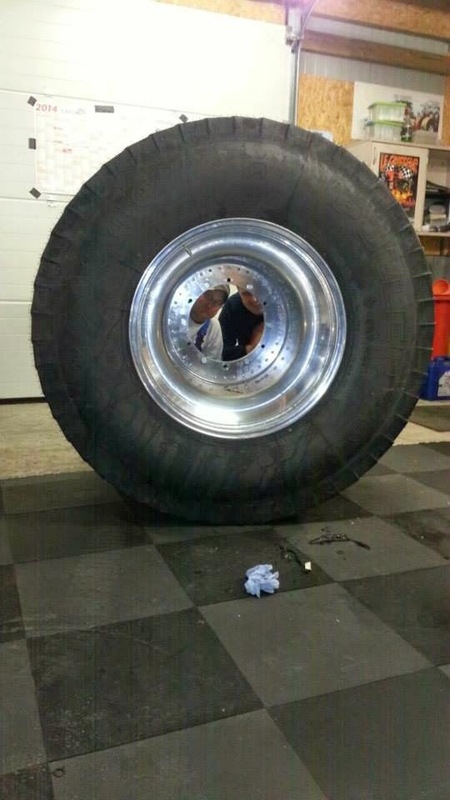 The Double Screamin´ got a new lighter crossbox and a set new Firestone Puller 2000 HP tyres. The new crossbox was constructed / designed by Bennie Vreemann (Vreemann Special Parts) and was milled by Breman Machinery in the Netherlands. The Team will compete in Dutch Grand National Championship (Mod division) and in the Euro Cup (Light Mod division) this year. The new The Challenger is ready ! The new The Challenger mini rod is ready. The mini rod got a new 42 CrMo04 tube frame. The driver´s position is more forward and the center of gravity is lower in the new frame. The Team hopes to get a better balance with the Cepek tyres with those changes. Also, the tractor got a newly constructed and lighter rear axle, new drive shafts, a newly constructed planetary gearbox behind the engine and a new 2 discs clutch. The Rover Meteor V12 tank engine was revised and got a new DMPE 18-71 blower with a carbon scoop and a new fuel tank. The engine is 6,5cm more forward, than in the old chassis. The new fenders are made from carbon fiber. The Team from Goudswaard, in the Netherlands will compete in the Dutch Grand National Championship this year. 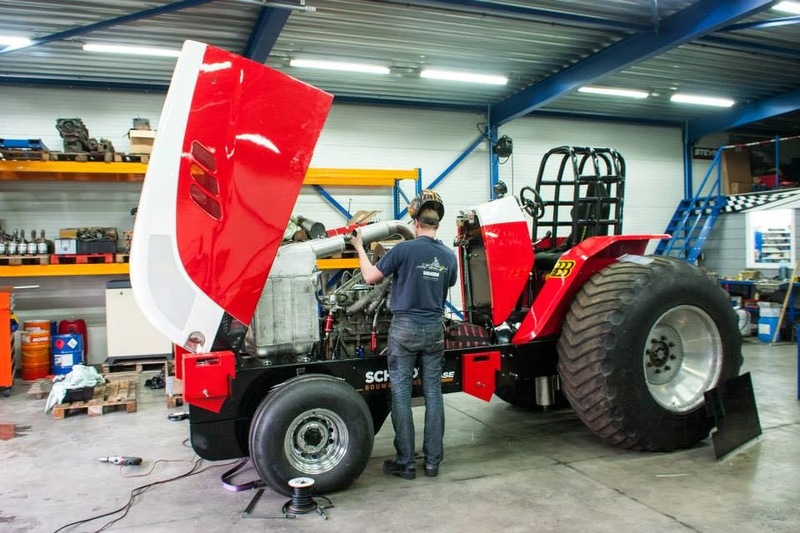 The Le Coiffeur Pulling Team from Georgsmarienhütte, in Germany are working on their Light Modified tractor at the moment. The RR Griffon V12 engine was revised and got some new exhaust pipes. 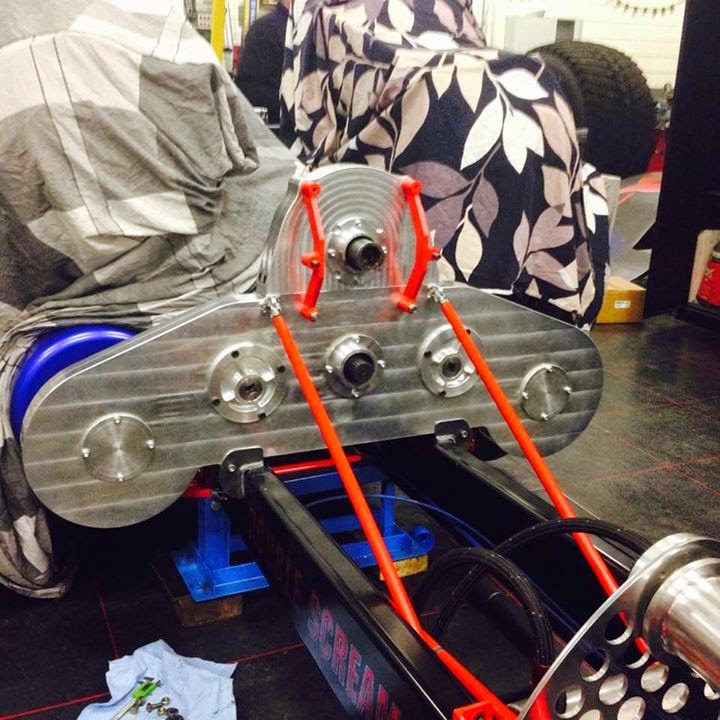 The new carbon fiber valve covers were made by Wil Bijmakers (Alligator Pulling Team). 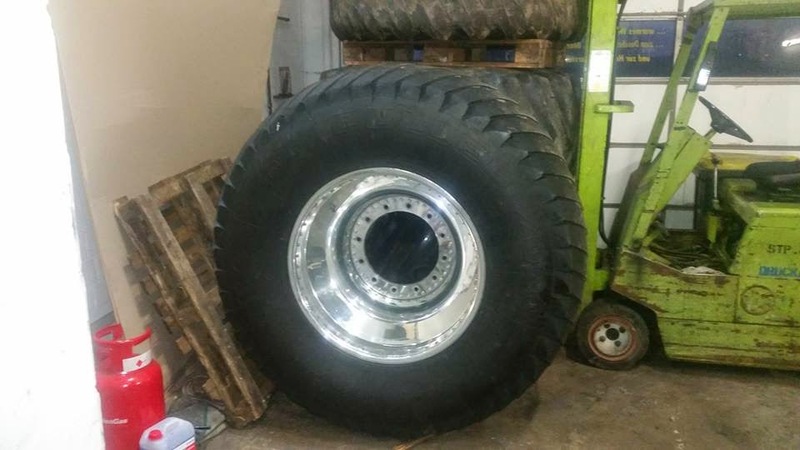 The rear axle of the tractor gets new home made planetary carrier housing and the single Griffon machine will be put on a new set of Northern Sheen rims with new Firestone Puller 2000 HP tyres. The Team will compete in the German Championship this year. The first start is planned for the 26th of April 2015 in Füchtorf, Germany with those changes. John Deere 1 sold ! The Danish John Deere Pro Stock tractor called ,,John Deere 1`` was sold (without the engine) to Sweden. 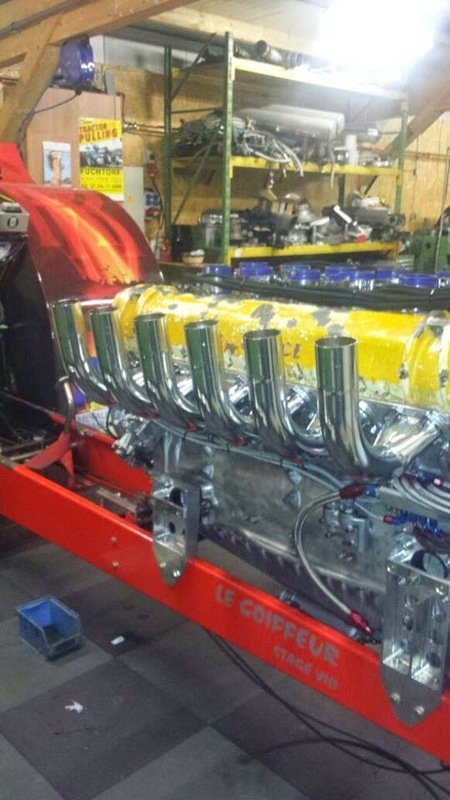 The Team will build their own engine for the JD Pro Stock tractor. The new owner of the tractor is the Green Dragon Pulling Team from Jämjö, in Sweden. The Team will compete in the Swedish Championship and in the Euro Cup this year. It's with great sadness that we (SWTPA) have to inform you of the passing of Steve Mason. You will be missed by us all, our thoughts are with his family at this time. Steve ran the Fordson Major called Skipper in the Under 401 Pro Stock class with the BTPA, a class that Steve help get started back in the 90’s. As far as Fordson Majors go Skipper was about as good as they come and won many championships. Below is Steve in action at the Heddington and Stockley Steam Rally with the SWTPC. It doesn't always go the right way ! 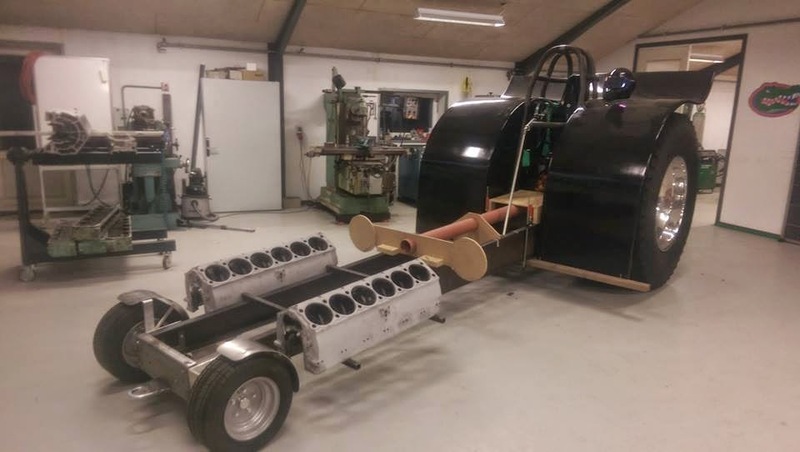 Also, the Boomerang Pulling Team around Ralf Woltering from Germany, are working on their Curtiss Wright powered Modified tractor at the moment. 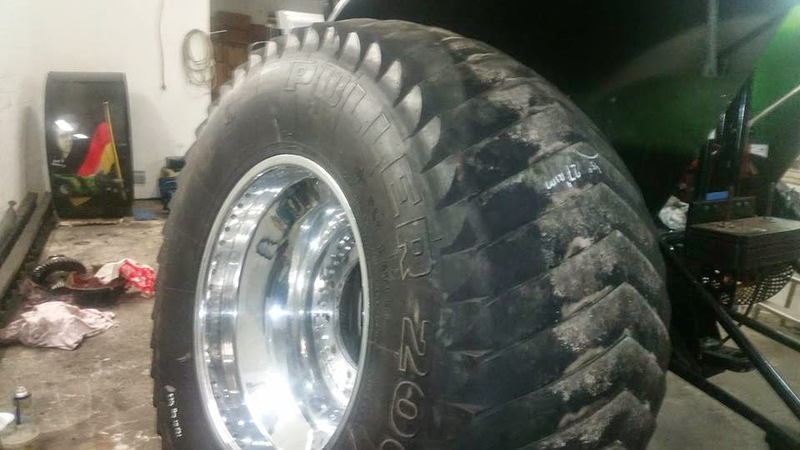 The differential in the rear axle of the tractor, was made 6 km/h slower and the team bought a set used aluminium rims with Firestone Puller 2000 HP tyres over the winter. The team will be compete in the German Championship this year. 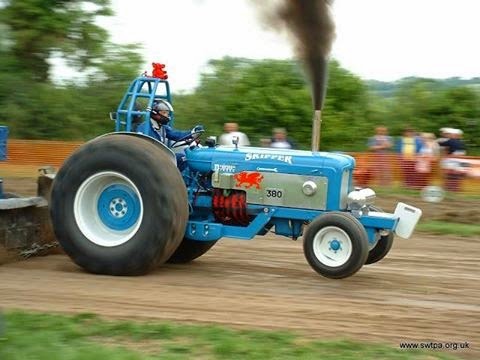 The Dutch Steyr Pro Stock tractor called ,,Rednex´´ got a some changes during the last winter. The old Steyr CVT 170 hood was replaced by a new CVT 6230 hood. Also, the intercooler of the 6 cylinder engine got some small changes. 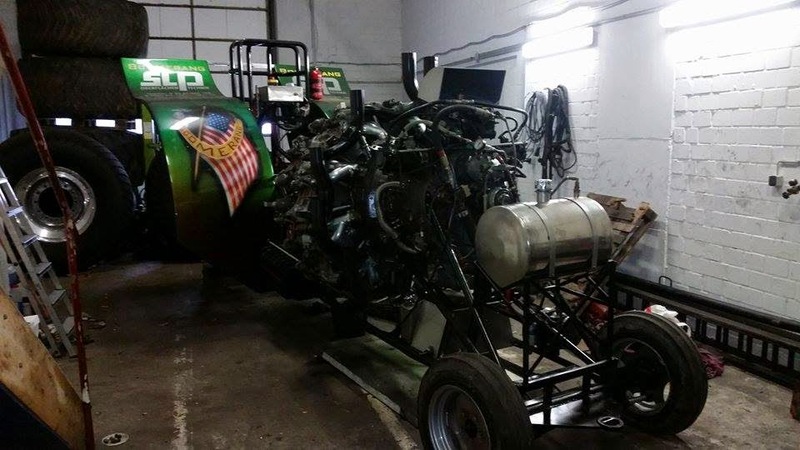 The Team from Vroomshoop, in the Netherlands driving with a homemade 5´´ turbocharger on the engine, since last year. 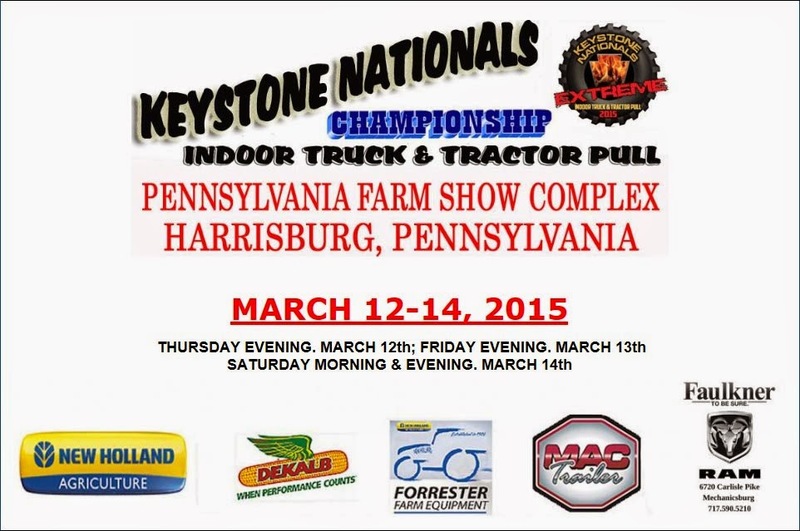 The Rednex Pulling Team will compete in the Dutch Grand National Championship this season. the new Intertechno Lambada is ready ! Also, the new Intertechno Lambada of the Dingerink family is ready. The tractor got a new Domex wedge frame with a few adjustments at the front end and a newly / better fixation of the rear axle. And last but not least, the both front KB V8 Hemi engines were replaced by 2 new BAE V8 Hemi engines. 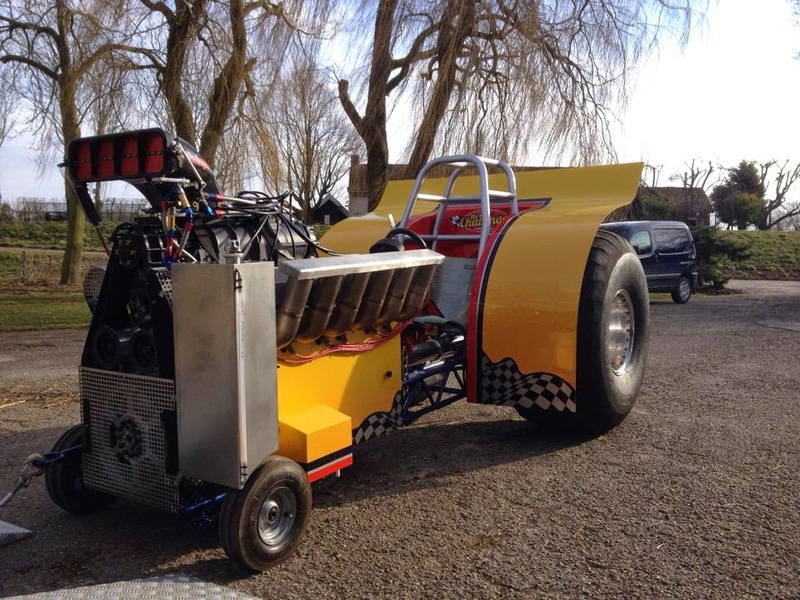 The Team from Zwolle, in the Netherlands will compete in the Dutch Grand National Championship (Modified & Unlimited class) and in the Euro Cup (Super Modified division) this year. The new MPM Seaside Affair is ready ! After a lot of work during the last few weeks, the new MPM Seaside Affair is ready. The Modified tractor got a new Domex wedge frame, a new rear axle and a 3rd TFX NRE X-1 V8 Hemi engine. The Team from Castricum, in the Netherlands will be compete in the Dutch Grand National Championship (modified & unlimited division) this year. !Photos from Ahoy are online! !Photos from Loosbroek are online! Come join in at 21:00h CET!